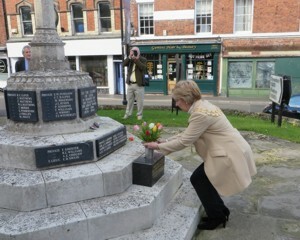 75th Anniversary of the deaths of Cyril Swain and other airmen following the Great Escape. Service led by the Rector, Nick Heron, assisted by David Smith. Tulips were selected because one of Cyril Swain's grandmothers was Dutch. 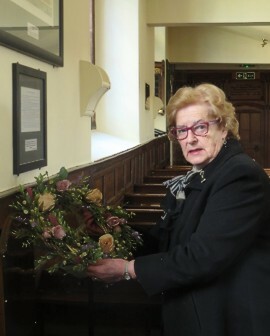 Wreath of everlasting flowers to be laid inside the church. 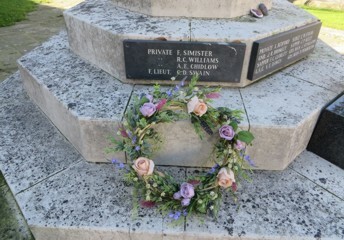 The wreath in situ. Bright sun and a chill wind greeted the 30-plus people who attended the ceremony. Representatives from a number of organistions including Wem Town Council, Royal British Legion (Wem), Wem Civic Society, Shropshire Council plus other Wemians were present. The service at the War Memorial was dedicated to Cyril Swain while the service inside the church encompassed all the 50 airmen killed. Great emphasis was placed on the sacrifice of those airmen, which allowed us our freedom, and the triumph of good over evil. including the memorial built by POWs of the camp. 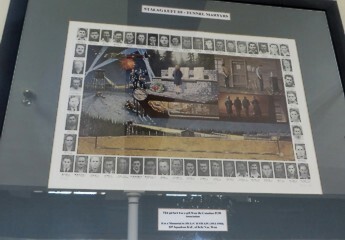 the surround is made of images of the pilots who were killed. It was presented to Wem by the Canadian POW Association. Wem Library staff and Wem Civic Society organised a book and information display in the foyer of the library. The information display covered the life and family of Cyril Swain, Stalag Luft III and the POWs, the Escape and Aftermath, and the important part played by the deaths of the airmen in the Nuremberg Trials. March 12th to April 11th, 2019. Wem Town Hall streamed and event from the Apollo Threatre, London, which included a showing of the film, 'The Great Escape'. Sunday, March 24th, 2019. [Shropshire Star report] On Wednesday 25th March 2009, Wem's civic leaders got together to remember Cyril Swain for his role in the Great Escape. 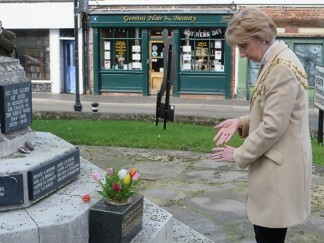 The Mayor of Wem, Councillor Pauline Dee, laid a posy of fresh spring flowers at the town's war memorial to mark the 65th anniversary of the escape. Also present were county, district and town councillor Chris Mellings, Wing Commander Tim Owens, deputy station commander and Squadron Leader Neil Hope at from RAF Shawbury, plus members of the Royal British Legion, Rotary and Probus clubs and other Wem Town Councillors. Prayers were led by the Rector of St Peter and St Paul Church, the Reverend Christopher Cooke and a two-minute silence was held. 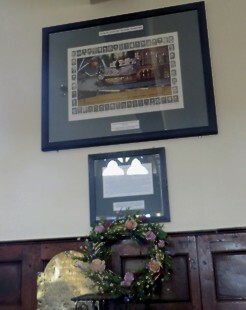 In 2010 a series of displays and talks organised by Wem Civic Society featured the story of the Great Escape. Wem Town Hall also put on a special viewing of the film of the Great Escape. Click here to return to Roll of Honour. Click here to return to the story of Cyril Swain. Click here to return to Memories of the Swain business.